False codling (Thaumatotibia leucotreta) is a Small moth (6-9 mm long) which is active at dusk and during the night. It is a significant pest because of its potential economic impact on many crops, including stone fruit, avocado, citrus, corn, cotton and macadamia. The life cycle has four stages comprising of egg, larva, pupa and adult. Eggs: The eggs are laid singly or in bunch on bolls or fruits on ridges or near the calyx of fruits or on foliage and debris. The eggs are small in size (< 1mm), white to cream in colour when freshly laid, flat and oval with shinny reticulate sculpture. Eggs take 2-22 days to hatch depending on temperature. Larva: There are five larval instars and they vary in size and colour. On hatching, the larva chews through the skin and feeds within the fruit where larval development takes place. The first three instars are white to cream in colour while the fourth and fifth instar is bright red of pink. The head capsule is brownish black for the early instars tending to light maroon in fully grown larva. Larval size ranges from 1 mm in first instar to 20 mm in 5th larval instar. Mature larva exits the fruit and drops on the ground on silken threads for pupation or in dropped fruits, crevices under the back or within galls. Larval period lasts 12-67 days depending on temperature. Pupa: cream yellow to dark brown in colour when mature. Females take shorter period to emerge 11-39 days while males take 13-47 days. The male pupa is small in size than female and has two knobs side by side in the centre lacking in females. Both female and male pupae have serrated posterior ending. Adult: are active at night and spends days while resting in shaded portions of the host. Are poor flyers with limited dispersal and moth activity increases with the onset of host flowering thus larval presence is common in the late fruiting season. Adults measures 6-9 mm in length and 2.5mm in width while at rest 6 and are greyish-brown to dark brown in colour. Males are attracted to females for mating by pheromones release by females after dark. Adult moths lay eggs on the capsicum fruit mainly near the calyx or in depressions of the fruit singly or in batches. First larval instars chew through the skin creating a small entry hole which is difficult to detect, mainly near the calyx. A scar may be left at the point of entry when healing occurs. Feeding is restricted near the skin surface by the young larvae but once they mature, they move deeper into the fruit. 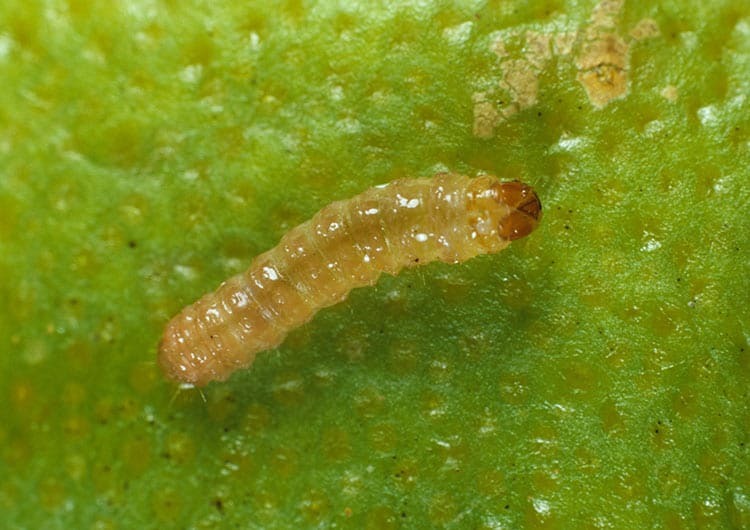 Fras (darkish in colour) and damage inside infested fruit Larvae feed on the fresh and darkish granular excreta can be seen when the fruit is cut open. A mature larva exits the fruit by eating through the skin for pupation leaving an opening for. Secondary infestation by fungus and scavengers may occur further damaging the fruit.